Near the village of Kipoi in Zagori 39 km. from Ioannina, there is the beautiful bridge of three arches. Its name is Kalogeriko because of the wooden one that Roussis from Negades had made it for the habitants to go to the mill. Then the abbot Serafeim from the monastery of Prophet Elias contructed a new stone-built one in 1748. 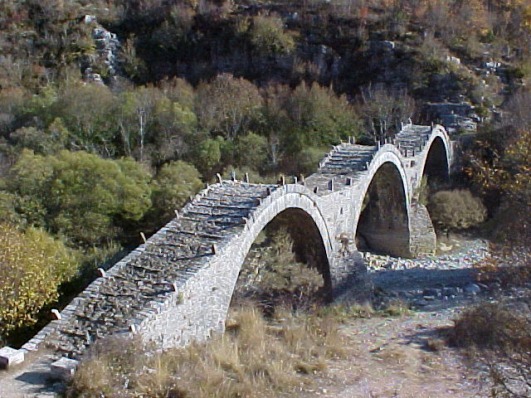 It also took the name of Plakidas because in 1863 Alex and Andrew Plakidas from Koukouli reconstructed it. In the same year they reconstructed the nearby fountain which has the name: “Fountain of Plakidas“. In 1912, Eugenios Plakidas gave his money for a new recosntruction. 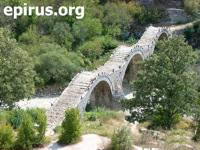 Until 1964 three more reconstructions followed and George Mylonas, minister of the government at this year classified it to the preservable bridges. The watermill that there was next to the bridge, had also a fulling. The miller’s heirs, sold the watermill to the monastery St. Elias of Vitsa and finally became property of the village of Koukouli in 1851. Nowadays, the mill has fallen and left olny the bridge in the same place.